Wayne Mark Rooney was born on October 24th, 1985 in Croxteth Liverpool, England to parents Thomas Wayne and Jeanette Marie Rooney and is of Irish descent. Rooney has two younger brothers Graham and John, all of which attended Our Lady and St. Swithins primary school, and the De La Salle Humanities College, a boys voluntary aided secondary school in Liverpool. Wayne Rooney currently plays as a forward for the English Premiere League club Manchester United, wearing number 10, and is a member of the England National team. Wayne Rooney’s early soccer career began when playing for the Liverpool Schoolboys, a team which he held the club record of 72 goals in one season until it was recently broken in May of 2010. When he was 9 years old Rooney moved from the Liverpool Schoolboys to the Copplehouse Boys’ club, a part of the Walton & Kirkdale Junior League, scoring 99 goals in one season and gaining the attention of Bob Pendelton, a scout for Everton F.C. After being recruited by Everton Rooney scored 114 goals in 29 games in the Under 10’s and 11’s and by the age of 15 he was playing for Everton’s under 19’s. In 2002 Rooney scored 8 goals in 8 games for Everton leading up to the clubs victory in the Youth Cup Final. Rooney worked his way up to the senior Everton team and made his league debut on August 17th, 2002 becoming the second youngest first-team player in the team’s history behind Joe Royle. His first senior goal for Everton came on October 2nd, 2002 when he scored twice in a 3-0 victory against Wrexham in the League Cup, Making Rooney Everton’s youngest ever goal scorer at the time. On October 19th, he scored a last minute game winner against Arsenal becoming the youngest player to score in a Premier League match at the time. Rooney was named the BBC Young Sports Personality of the Year in 2002, which is awarded to the sportsperson aged 16 or under as of January 1st of that year, who has made the most outstanding contribution to the their sport in that year. In August of 2004 Rooney was offered a £12,000-a-week contract from Everton, but his agent refused the offer. 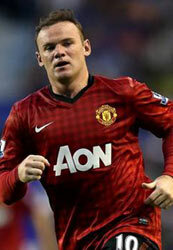 After hearing of the refusal, Manchester United and Newcastle United began to compete for a contract with Rooney. Manchester United eventually won the contract bid with an offer of £25.6 million. Rooney was only 18 at the time of the offer, making it the highest offer ever paid for a player under the age of 20. Rooney wore number 8 for Manchester when he made his league debut on September 28th, 2004 scoring a hat trick and an assist in a 6-2 victory against Fenerbahce in the UEFA Champions League. Rooney became the youngest player to ever score a hat-trick in the UEFA Champions League. Although the 2004 season ended without winning a trophy, Rooney won the PFA Young Player of the Year award and was Manchester United’s top league scorer with 11 goals. In 2007 Rooney was given number 10, formerly worn by Ruud van Nistelrooy ex Manchester United player and the third highest goal scorer in Champions League History. On October 4th, 2008 Rooney became the youngest player in league history to make 200 appearances. He became the 20th Manchester United player to score at least 100 goals for the club on August 22nd 2009. On January 31st, 2010 Rooney scored his 100th Premier League goal against Arsenal (Rooney’s 1st Premier League goal also came against Arsenal). Later during the ‘09-‘10 season Rooney was named the PFA Players’ Player of the Year Award, an award given to the best player of the year in English Soccer. Rooney continues to play for Manchester United and the English National Team in 2013 and will continue to impress with his incredible goal scoring ability.